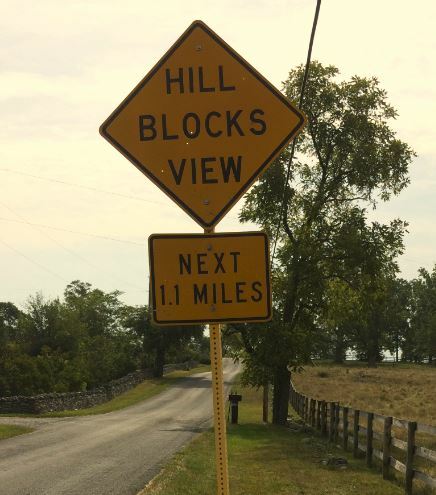 Not far from my bee yard is a road sign stating “Hill Blocks View”. As this road has several big hills, this tidbit of helpful information always puts a smile on my face. It is an appropriate warning as I’m usually looking around for what is blooming – more looking than driving. So what beekeeping hills block my view? I just finished my mid-summer mite treatment and started fall feeding. My beekeeping method may have become a bit too rigid. Build up the hives in March, make splits to control swarming in April, harvest honey in June and July, mite treat in August, and start feeding by September. This has worked well over the years but I should I look at what could be done differently? Is this my view blocking hill? Phone calls, text messages and emails about hives suddenly failing have been flowing in. Why are hives failing in August? The bee club I belong to is good at organizing first year bee classes, purchasing equipment in bulk, obtaining packages each spring, and being the central repository for questions like “why did my hive fail?” It has been this way for years. This spring the club purchased almost 300 packages selling most of them to established beekeepers. Next year will be the same process. That is a lot of lost bees and opportunity. I think that there has to be a way to see around this “loss is normal” hill. What is blocking the view and what can I do? In the past, I have mentored 3 or 4 new beekeepers each year. A few have continued on to become exceptional beekeepers. The vast majority give up after a disappointing first year as there is no club sponsored second year help available. Each year there are more and more new students looking for someone to help them. These second year beekeepers have no place to turn. This is a hill blocking the view. I want to remove the hill and help second year beekeepers become the exception to “loss is normal”. We need more successful beekeeper not more disappointed beekeepers. I need to see beyond that hill.